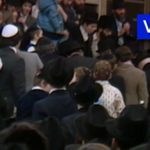 Recently discovered video footage, which sat unlabeled among a box of old videos, was matched to the Farbrengen with The Rebbe from 11 Nissan in 5741. The footage was meticulously restored and subtitled ahead of Yud Alef Nissan. 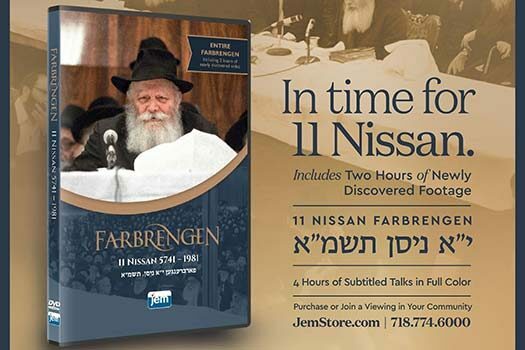 Each year on 11 Nissan, the Rebbe would hold a Farbrengen in honor of his birthday. The Farbrengen on this date in 1981, however, is particularly memorable. At the momentous event, broadcast live on television with simultaneous translation, the Rebbe delved into a wide range of subjects. Touching on the cause for the celebration and current events the Rebbe also launched a new campaign to promote Jewish unity. Culminating with the launch of the now famous campaign for the Children’s Sefer Torah, the Sichos have been studied, taught, and applied since that day. But while much of the Farbrengen has been published by JEM in the past, recordings of the final part of the Farbrengen, during which the Rebbe announced the new campaign, was long thought missing, until now. JEM recently discovered this footage, unlabeled, among a box of old videos. After matching the video to the Farbrengen on 11 Nissan in 5741, the meticulous work of restoring the footage and preparing it for production began. Now, in time for 11 Nissan, JEM has published the full Farbrengen for the first time. Beautifully restored and translated into English, Hebrew, and French, the video is a treasure for the generations. Each day over the next week, JEM will be highlighting excerpts of the Farbrengen. Subscribe to receive the clips by sending a WhatsApp to +718.774.6000 or find them at Facebook.com/JEMDailyVideo. No need to subscribe again if you’re already receiving JEM’s daily videos. This year, as we look to revitalize our connection to the Rebbe on the auspicious day of 11 Nissan, take advantage of this new avenue to strengthen that bond.